Heat oven to 450°F. Press pie crust into 10-inch tart pan; prick bottom and side with fork. Bake 10 minutes; turn oven down to 350°F. Bake about 10 minutes or until golden brown. Melt chocolate and 4 tablespoons of the whipping cream over low heat. Stir until smooth; spread into baked pie shell, coating bottom of crust. Refrigerate. In heavy 2-quart saucepan, cook butter, sugar and cornstarch over medium-high heat, stirring constantly, until thick and mixture boils; boil 1 minute. Beat egg yolks in small bowl; stir small amount of sugar mixture into egg yolks. Slowly add egg mixture to remaining sugar mixture in saucepan, stirring rapidly to avoid lumps. Cook 1 minute over low heat. Remove from heat; add vanilla. Cover and refrigerate 3 hours. Whip 1 cup whipping cream until stiff peaks form. Fold cold egg mixture into whipped cream with whisk. Fill pie shell with mixture. 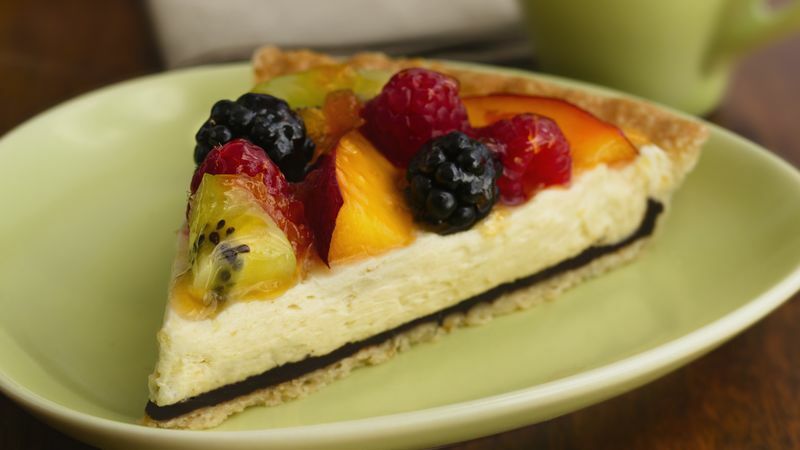 Top tart with fruit. Microwave apricot jam and water in small microwavable bowl uncovered on High 1 minute. Glaze fruit with jam mixture using pastry brush. Refrigerate 1 1/2 hours and serve. Unsweetened baking chocolate is unadulterated chocolate that contains 50 to 58 percent cocoa butter.